By now everyone knows there is a movie called Jobs which celebrates the life of Steve Jobs and tries to recreate the events which surround the tech legend’s life. Of course whenever such an ambitious project is undertaken, the challenge you have is getting agreement on what happened and just as importantly trying to get everyone involved in the happenings to work collaboratively. It is apparent this movie faced some challenges in both regards. For example, Ashton Kutcher who plays a pretty convincing Steve Jobs complained recently that Apple cofounder Steve Wozniak aka “The Woz” is being paid by another company to support a different Steve Jobs film. Former Apple CEO John Sculley had some thoughts on the movie as well – he was happy it vindicating him as not firing Steve Jobs. He said the same thing this past February in Miami at ITEXPO. He went on to say the movie was “Very loose on the facts.” Moreover he says Woz was not portrayed fairly as he was a genius engineer and that didn’t come through at all. At ITEXPO Steve Wozniak will be delivering a keynote address and this will likely be the first place you will be able to see the Woz live since the debut of this movie. For me, being a tech enthusiast, the ability to have access to the Woz is a highlight of my career. TMC has been fortunate to have amazing keynotes in the past like Al Gore, Carly Fiorina, Ron Insana, Tom Ridge, the past two FCC Chairmen Kevin Martin and Michael Powell, John Sculley and many others. This particular keynote however may be the most difficult to top because The Woz was so instrumental in starting Apple and this company literally changed the face of computing. Recently I wrote about how tech leaders are making a difference beyond the world of tech and how tech wealth is good for society and the entire economy. 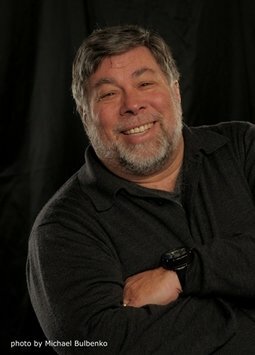 Steve Wozniak is one of the original tech inventors – one of the first technology legends to change the face of computing and technology while literally rekindling a revolution in Silicon Valley. It will be quite an honor to see him at ITEXPO and introduce him onstage – I can’t wait to hear the questions the audience will ask, what he has to say about his life, the movie and where he thinks tech is headed. I hope you’ll join me at the keynote yourself. As an FYI, ITEXPO keynotes require no registration fee.